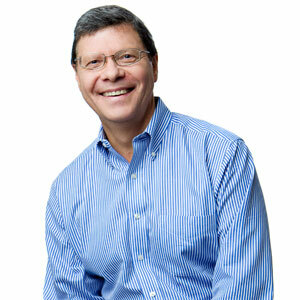 Conservative talk radio host Charlie Sykes of 620WTMJ. Photo from 620WTMJ.com. 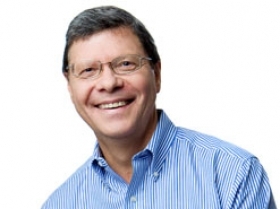 That Charlie Sykes, he sure has good sources. No one in the country knows the identity of those shadowy people who put up the scary billboard signs saying “Voter Fraud Is a Felony!” punishable by up to three and a half years in prison and fines of $10,000. Clear Channel Communications, which owns the billboards and recently decided to take them down, would not disclose the identity of the buyers. The only clue was the ad itself, put up on billboards in Milwaukee, Cleveland and Columbus, which claims it was paid for by a “private family foundation” but offers no other details. Ah, but Charlie knows who paid for the ads. And they are good people, ladies and gentlemen, a husband and wife who “thought they were were being good citizens,” Sykes assures us, without offering any direct quote to that effect. They are also a courageous couple, who “were not going to back down,” Sykes claims, when Clear Channel said they must reveal their identity or take down the ads. (The company says it has a policy against anonymous ads.) Nosiree, this couple was going to make a public statement, “a powerful statement of free speech,” Sykes assures us, while once again not offering one word of this powerful statement. And the statement would be sent to Sykes so he could put it up on his website. What a scoop that would have been for Charlie. And so the patriarch of this patriotic family decided to pull the ads, feeling “betrayed” and “frustrated by the bullying,” Sykes tells us, once again offering his own summation of what this unknown informant had to say. Sykes has often emphasized that he is not a journalist but an entertainer, and this was certainly an entertaining blog post. But did it include any journalism? Sykes says he spoke at length with the head of the “family foundation” leaving us to guess whether that’s actually what the group is. As for the idea the family is worried for the safety of its children and grandchildren, that seems a little overwrought. An actual journalist might have asked, and why exactly were your children concerned about their safety? The idea that the ads were stopped by “bullying,” as Sykes puts it, or by “leftist thugs,” as one right-wing web site charged, is intended to suggest that democratic actions are somehow vicious or even violent. In fact, those who objected to the billboards simply used the most peaceful and democratic means to pressure Clear Channel. The Lawyer’s Committee for Civil Rights, a voting advocacy group based in Washington, sent a letter to Clear Channel demanding they take down the ads. And Color of Change, a national civil rights group, got 65,000 people to sign a petition protesting the billboards. Using the same method, groups on both the right and left have frequently put pressure on advertisers. Since when do people have to worry about the safety of the children and grandchildren from the exercise of free speech? Sykes and other defenders of the signs say they are simply stating what the law is. But the sign offers no definition of voter fraud, so its educational value is rather limited. Meanwhile the judge’s gavel and the emphasis on punishment is a very scary message. The Cleveland Plain Dealer cited experts who estimated approximately 16,000 ex-offenders live in Cleveland. The number is undoubtedly in the thousands in Milwaukee, with many in inner city neighborhoods. Felons in Wisconsin cannot vote if they are still on probation or parole, but there is sometimes confusion over this; some in Wisconsin have been prosecuted for voting before they have become eligible. One can imagine some eligible to vote might be scared away. Eighty-five of the billboards were put up in Milwaukee and 60 in Cleveland and Columbus. The voting age populations in the neighborhoods in Cleveland and Columbus where the signs were placed are 96 percent black, 88 percent black and 76 percent black, the Huffington Post reported. The signs were distributed more widely in Milwaukee, but Mike Wilder director of the African-American Round Table, told the Milwaukee Journal Sentinel he counted about 20 of these billboards in African-American and Latino neighborhoods. Though the alleged goal here was to let people know the penalties for voter fraud, the billboards were largely targeted to voters, black and Latino, which polls show will vote heavily for Democrat Barack Obama. And they targeted the two states, Ohio and Wisconsin, that noted polling analyst Nate Silver has predicted are likely “tipping point” states that could decide the election: he estimates Ohio has an almost 50 percent chance of tipping the election while Wisconsin’s chance is just over ten percent. Sykes references an anonymous report in 2008 by some members of the Milwaukee Police Department (which Chief Ed Flynn criticized) claiming there was widespread voter fraud in Milwaukee, but in fact, the bipartisan investigation that year by Milwaukee County District Attorney John Chisholm (Democrat), and Attorney General J.B. Van Hollen (Republican), resulted in 20 prosecutions, mostly ineligible felons. Similarly, a joint investigation in 2004 by then U.S. Attorney Stephen Biskupic (appointed by a Republican president) and then District Attorney E. Michael McCann (a Democrat) found some isolated instances of illegal votes, again mostly by ineligible felons. -Sykes has vehemently denied that he gets his talking points from the Republican Party, but it is interesting that these billboards which target two key states for the party were done by an anonymous operative that only he has access to. -A New York Times analysis of states that passed the more restrictive photo ID laws shows it will only be a factor in two swing states: Virginia and New Hampshire. -An analyst of Google searches notes that they have been used to accurately predict voter turnout in 2004 and 2008 and this year show a similar level of engagement in the election by Democrats and Republicans, black and youth voters, as in 2008. That suggests the turnout could be similar to 2008, which is good news for Obama. The analysis also found a much higher interest among Mormons, which could help Romney in the swing states of Colorado and Nevada, as both have a significant population of Mormoms, the analysis noted. Did the liar Sykes say he didn’t get talking points without spitting up his chablis? He’s already on record getting talking points directly from the Walker administration-and then dutifully acting on them. This great, cowardly, right-wing perpetual motion machine of illegal coordination and corporate contribution goes on, and on, and on. “The company says it has a policy against anonymous ads”. If this is true, why did Clear Channel put the ads up in the first place? Sykes is a right wing talk show host, he does not hide it. Whats the difference of this being displayed on a billboard and at a polling place, since its displayed at the polls? 20 out of 85, does not seem like they are heavily in minority neighbors. There are many resources for a felon to find out if they can vote, 1. ask their parole officer? 2. Ask poll rep. When did all the felons become democrats? Sykes gives his talking points to the GOP. voter fraud is a fact in Milwaukee cty, always has been. McCann never prosecuted anyone except Jim Devitt, a Republican. Don’t agree? Read the police report that Barrett wanted to suppress and ask Lena Taylor why she has 37 people registered at her address. Check what happened down in Racine. Note to Getch, good question on felons. UWM ETI study shows 67% of those released from prison from 1993-2008 in Milw County are African American and we know that polls show more than 90% of black voters support Obama. So there is a high correlation, at least in this city, between felons and Democrats. One good fraud deserves another, and another, and another. If you want to tip an election one way or the other don’t you think it is a lot easier to just get out the millions and millions of legitimate voters who don’t vote? If Marty Weigel were to ever go to the Pick N Save near 70th and Greenfield, or the Kmart on the corner he might have a different understanding of why that corner may well be a fine location for exposure to what he so eloquently labels black and brown. “black and brown” are not my labels.. comes from the Huffington Post quote. I have lived in West Allis for 32 years in this neighborhood. Last spring, during my campaign for elected office I knocked on every door in this neighborhood. I stand by my observation. My intent was to point out that the quote from Rashad Robinson was not accurate. BTW, I shop at PNS weekly, K-Mart only as a last resort. An observer can draw only one conclusion about the character of Mr. Sykes in light of his ongoing use of racist political tactics. Surely Mr. Sykes’ father, the late Jay Sykes, an esteemed journalist of an earlier generation, is spinning in agony in his grave over his son’s status as standard-bearer for racism and bigotry. billboards were in many communities. i am not on the side of sykes but, the claim of ‘only in brown or black neighborhoods’ is completely false. this is easily verified. i saw one on hwy 45 near good hope and i know of one in caledonia, just to mention 2. For a year, the Republican National Committee has portrayed Democrats as the villains when it comes to voter fraud. The authorities in Florida are reviewing “numerous” complaints about voter registration efforts by a company run by Nathan Sproul, shown in 2004. The tables have turned, however, and Republicans are now playing defense over the role of a well-paid operative, Nathan Sproul, in a voter registration scandal that emerged in Florida and has spread to other states. The Florida Department of Law Enforcement said it was reviewing “numerous” claims involving a company that Mr. Sproul runs to determine if a criminal investigation is warranted. Complaints have surfaced in 10 Florida counties, among them allegations that registrations had similar signatures or false addresses, or were filed under the names of dead people. In other cases, party affiliations appeared to have been changed. In recent days, similar claims against Mr. Sproul have arisen in Nevada and Colorado. You sometimes have to wonder why the Republicans are so big on voter fraud. Could it be that they know that people in their own party commit voter fraud so the Dems must be doing it also, or that they know that they would commit voter fraud if they were sure they could get away with it, so that must be how everyone thinks? @Bruce Murphy “a high correlation, at least in this city, between felons and Democrats.”?!? You might want to take a moment to look up the definition of correlation. Interesting to read Clear Channel’s history on its website. Cherchez le patriarch??? In October 2006, the Company announced that its Board of Directors was evaluating various strategic alternatives to enhance shareholder value. The Board of Directors retained Goldman, Sachs & Co. as its financial advisor in connection with its evaluations. In November 2006, the Company announced that it had entered into a merger agreement with a private equity group co-led By Bain Capital Partners, LLC and Thomas H. Lee Partners, L.P., pursuant to which the group would acquire Clear Channel. On July 30, 2008, the Company announced the completion of a merger with an indirect wholly owned subsidiary of CC Media Holdings, Inc., a corporation formed by a private equity group co-led by Bain Capital Partners, LLC and Thomas H. Lee Partners, L.P. The total transaction is valued at approximately $24 billion. CC Media Holdings, the new parent company of Clear Channel Communications, begins trading on the Over the Counter Bulletin Board under the ticker symbol CCMO. Clear Channel Radio launches first version of its free streaming radio application known as iHeartRadio.